Profile Builder, the precursor to SocialVision. Try SocialVision FREE: Sign up for the beta! 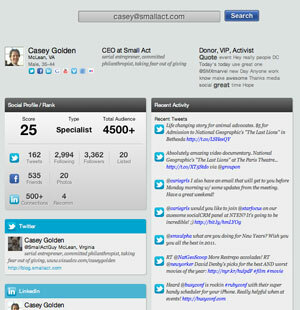 SocialVision (formerly Profile Builder) is a social data intelligence solution. SocialVision, a cloud-based social data intelligence platform, makes social data instantly usable throughout your organization. Event planners get data analysis on participants. How does it work? SocialVision connects social data (data gathered from social media) with the transaction and financial data from your organization’s CRM system(s). SocialVision analyzes all of the data and delivers exactly what each user needs. So if you want to get in on the beta launch in May 2013, sign up today, and we’ll hook you up with a free account and 1,000 profiles for free! Try it out...we know you will love it as much as we do! Track detailed information on the prospects and donors you are managing, to improve your performance and results. SocialVision will help you identify ideal Sustainers (monthly subscribers), Team Captains (local leaders), Executive Prospects (those with Manager and above professional level), and more. Subscribe to people of interest (prospects, donors, etc.) and opt in to be notified by text or email when there are key changes to their profiles. For example, a major gifts officer can subscribe to prospects and be alerted when a job change or location change occurs, or if your prospect talks about your cause on social media. Receive daily or weekly emails that summarize everything happening in social media that is relevant to your specific prospects. Define criteria using both social and traditional data to build targeted segments of your constituents. For example, an organization could get a list of the people for an advocacy campaign who have donated over $100, have performed some advocacy action in the past and and have retweeted them at least twice. After getting the results of a Smart Search, export the list to use with your marketing communications system or email system - either automatically or on-demand. This way you will have the most up-to-date prospect list and can effectively tailor content for a marketing campaign. The data in each client’s "cloud" within the SocialVision platform is accessible through the web applications, but it is also built for data integration with other systems, like CRMs. SocialVision will also work on any mobile device without needing to install an app. Which organizations are using social data? Read "Understanding The Value Of Your Social Media Influencers," a June 2012 white paper co-authored by Small Act, Blackbaud, and the National Wildlife Federation.